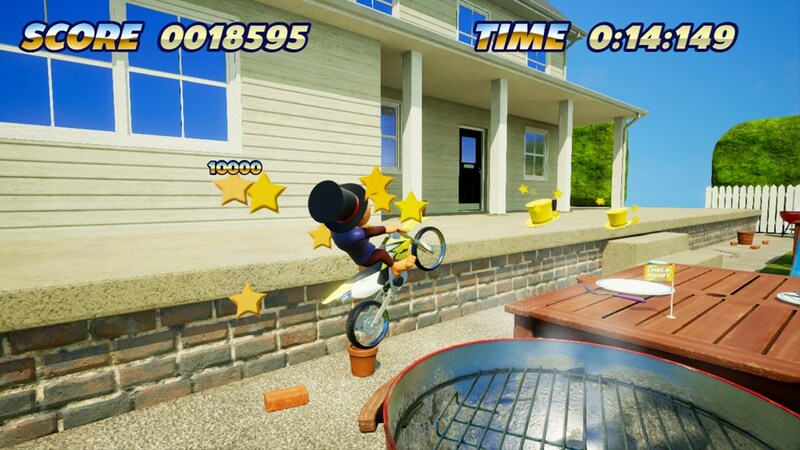 Toy Stunt Bike: Tiptop’s Trials quietly released on the Switch eShop late last month, amidst bigger August titles like Bad North, Blade Strangers, and Victor Vran. I nearly missed out, but am glad I eventually caught it. The original on 3DS was good fun, and so is this Switch follow up. There really are three ways to play here. You can take a racing approach, and aim to cross the finish line in a speedy fashion. 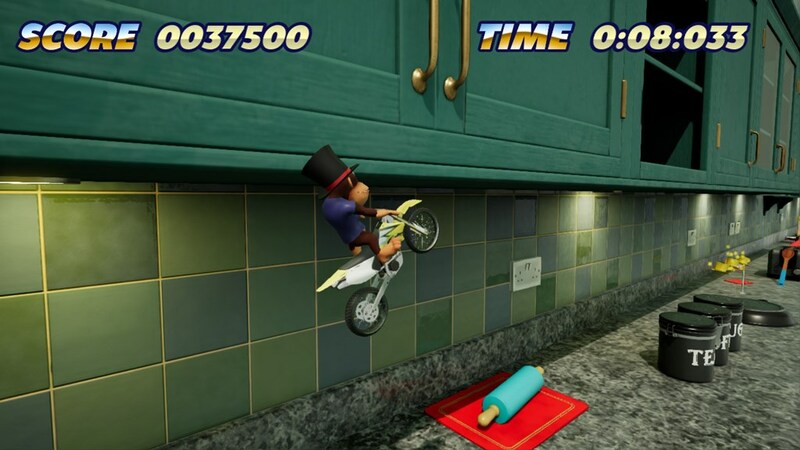 You can focus more on big jumps, flips, and tricks. Or you can take a more moderate path and search for hidden flags. Each offers a trophy, so you’ll be replaying most if not all of the 36 tracks to earn all three. The 36 tracks are about a third less than what was found in the 3DS version. I do wish there were more, but at least what’s here is better looking. On Switch, the tracks are smooth, and have a nice sheen with improved detail. I had fun spotting Wobbly Tooth Easter eggs. 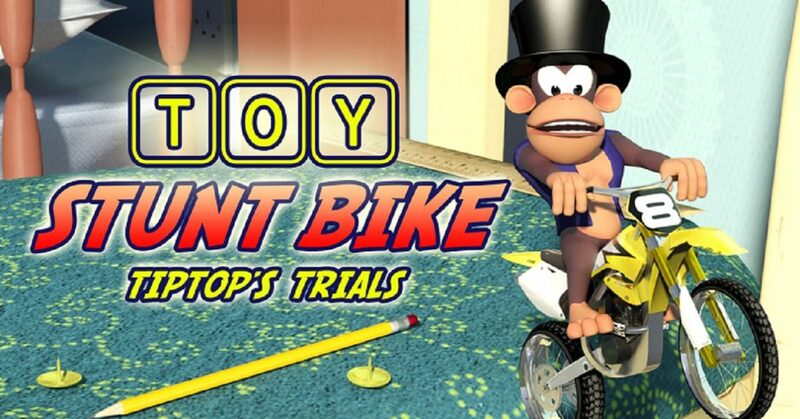 The chimp riding the bike, Tiptop, adds a bit more personality than the nameless biker from the original. The accompanying soundtrack makes for an enjoyable listen. Any game that includes Waterflame’s optimistic tunes is a winner, and I was happy to find the means to adjust the volume options so I could enjoy the music even more. As you ride across kitchen countertops, living room furniture, and even outdoors, you’ll find yourself crashing a lot. At times I feel like I’m on the cusp of losing control. Thankfully, the controls themselves are uncomplicated. The crashes, with destructible scenery, are eye-catching and have HD rumble. Checkpoints are generous as well. My main issue with these is the brief pause that accompanies continuing from a checkpoint. Though small, they do add up, and the 3DS offered a near seamless continuation. Though advertised as “Ideal for handheld, short burst play.” I found myself finishing the game in a single day, because I was having fun. Of course, my trophy count was very low, so I had things to aim for on replay. I eventually unlocked the secret area, which I won’t spoil. Another replay incentive is the online leaderboards. They are occasionally glitchy, but they load quickly. I’ve hit the top five on a few, which is quite satisfying. While the content is light, Toy Stunt Bike: Tiptop’s Trials is quite fun while it lasts. If you’re drawn into mastering the game, like I was, it will last much longer. If you’re looking for a game to make you grin and chuckle, $4.99 is pretty cheap for this joyful little romp. Check out the demo if you need more convincing. I’d like to see Wobbly Tooth bring the sequel (with track editor) to the Switch next. That, or a sequel to The Magic Hammer. 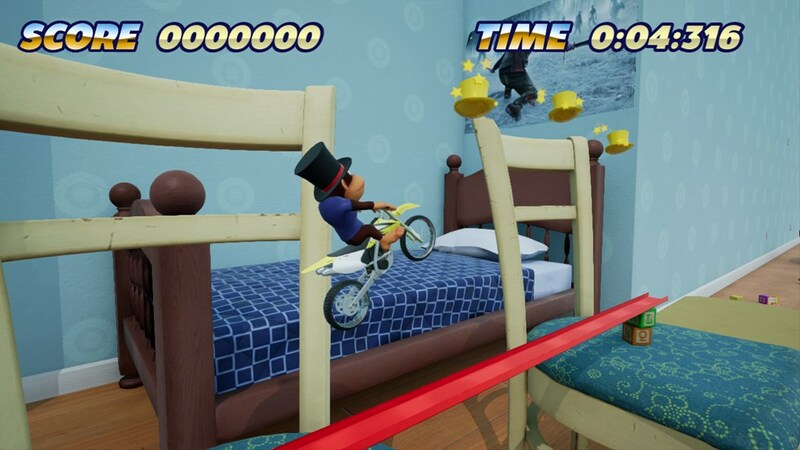 While the content is light, Toy Stunt Bike: Tiptop’s Trials is quite fun while it lasts. If you’re drawn into mastering the game, like I was, it will last much longer. If you’re looking for a game to make you grin and chuckle, $4.99 is pretty cheap for this joyful little romp.